Note: This book was also published under the title The Physick Book of Deliverance Dane. This book got a lot of attention when it was first published a couple of years ago and I couldn’t wait to read it as I thought it sounded like something I would really enjoy. But after seeing quite a few negative reviews I wasn’t so sure and decided that maybe I wasn’t in such a hurry to read it after all. I finally picked it up in the library last month and thought I’d give it a try. The Lost Book of Salem (I’m not sure why it was necessary to change the title) is a dual time-frame novel, with part of the story set during the Salem witch trials in the 17th century and the rest of the story taking place in 1991. 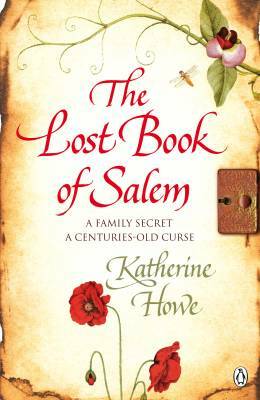 The modern day storyline follows Connie Goodwin, a history graduate who is attempting to track down a spell book belonging to Deliverance Dane, one of the Salem women accused of witchcraft in 1692. Connie believes the book has been passed down through the generations and could still be in existence. Through a number of flashbacks we meet Deliverance Dane herself and some interesting questions begin to arise: could she really be a witch – and does magic really exist? I wish I could say I had enjoyed this book, but I didn’t. I had trouble with Katherine Howe’s writing style, which was overly descriptive and made the story drag in places. I also found the plot too predictable – it was interesting enough to keep me turning the pages, but there were no real surprises. As the main character, I found Connie very irritating. Considering she was a PhD student and supposedly an expert in colonial American history she was very slow to pick up on clues that were obvious even to me. She didn’t appear to have much knowledge of the period she was studying either – I’d have thought she would have known that ‘receipt’ used to mean ‘recipe’, for example, and she seemed to be mystified by the word ‘bottel’ before it finally dawned on her that it was just the phonetic spelling for ‘bottle’. Deliverance Dane was a more interesting character and I would have preferred to have spent longer in the 17th century, rather than just the brief interludes that we were given. There were still a lot of things to like about this book, though. The historical sections were atmospheric and appeared to have been well-researched. And for anyone with an interest in the Salem witches, the book goes into a lot of detail about the trials and the events that lead up to them. So, although I was disappointed by it, I’m sure other people would enjoy it more than I did. I enjoyed this book but agree that Connie was a little annoying. I wasn’t too impressed with Howe’s writing style either but thought the story made up for that. I’m glad you liked it, Jean. I thought the story was good but unfortunately there were too many other things about the book that didn’t work for me.